Having the option to carry your bike on a bus is great as a backup plan if you have mechanical issuses, terrible weather, or if you're just starting to commute to work & it's a long distance. 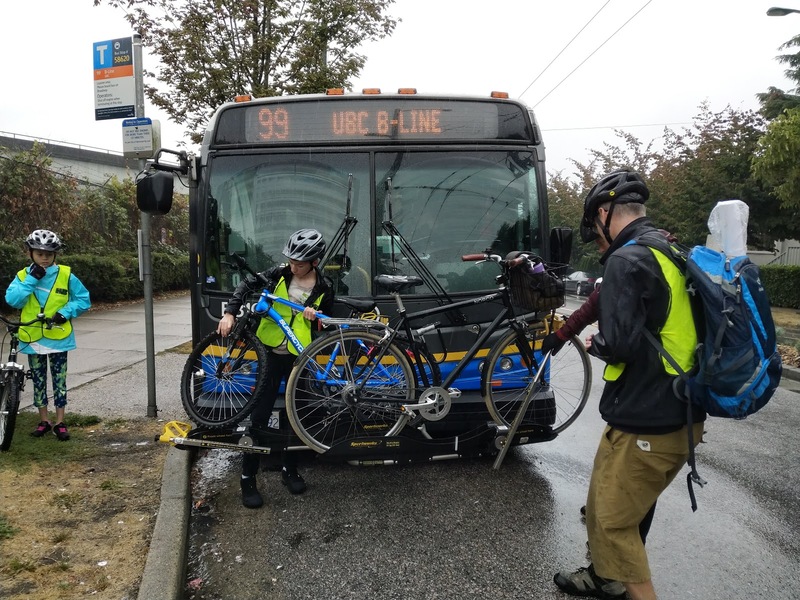 Being able to use the bus bike rack makes touring--especially with a kid--a lot more possible, & the bus system can help you get through the various tunnels & bridges & highways around Metro Vancouver that you can't or don't feel safe riding on. Translink bus bike racks accommodate bikes from a 16" wheel up to a 700c. 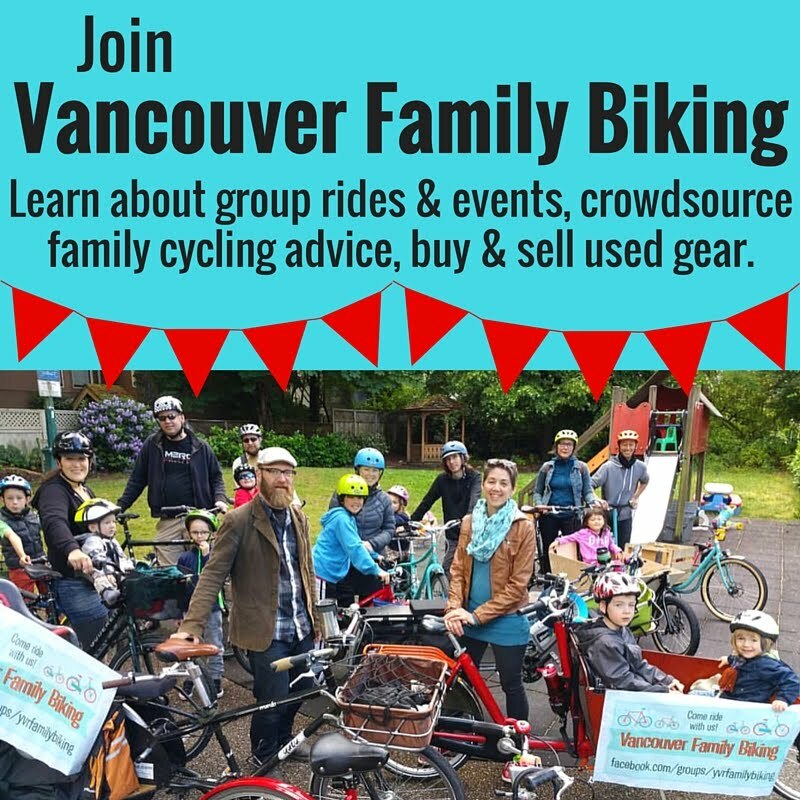 That covers the vast majority of two-wheel bikes out there, even folding & children's bikes. BUT. Big but. How do those racks work? Am I going to be able to figure one out when I need to, with a bus load of people staring at me? Using the bus bike racks can be a bit intimidating at first. It just takes a little practice, however, & then loading your bike on a bus goes much more smoothly! Consider starting your trip at the first stop or a layover point if you can, to make the process more relaxed. The first stop means you'll be the first to load, so the two spaces on the bike rack won't be full already. Pack your panniers or basket so they're easy to pull off the bike or unpack before loading it onto the rack. You're not allowed to leave them on the bike as they can impede the driver's view. Watch this video to see how the rack folds down & how the extendable arm works. Then ride your bike to a bus loop or layover point along a route & ask the driver if you can practice with the rack. There are also two practice racks permanently installed outside Main Street Skytrain Station & North Vancouver City Hall. When you lift your bike, grab it on the front fork with one hand (this prevents the front wheel from flopping around & hitting you in the head with your own handlebars) & the seat tube with the other so you can lift it as high as needed. Put your bike on the back spot so another person can use the front one. Be ready at the bus stop pole before the bus arrives & make eye contact with the driver so it's clear you're planning to use the rack. Once you get on the bus, tell driver where you're planning to get off. Stay near the front, so you can keep an eye on your bike. There's usually a luggage rack area just inside the front door where you can stash your bags. When you're going to get off again, let the driver know, & then get off via the front doors. Don't forget to put the rack back up if it's empty! Once you've taken your bike off the bus, move onto the sidewalk to reattach panniers, etc. Don't stand in travel lane or cross in front of the bus. Visit the Translink Bikes on Buses page for more information. I hope these tips are helpful in demystifying the bus bike rack! I put my bike on the bus occasionally as part of my commute to work when I'm travelling farther than I want to ride, or I want to avoid a particularly heavy traffic route. (Check out the hashtag #bikebusbike or #biketrainbike to see pics on Instagram.) We have also used transit to make bike touring more doable when we're hauling children & camping gear. Have you got any other handy #bikebusbike tips or stories to share? Let me know in the comments below.